I don’t think I’ve met one healthy living blogger who dislikes it. Why? 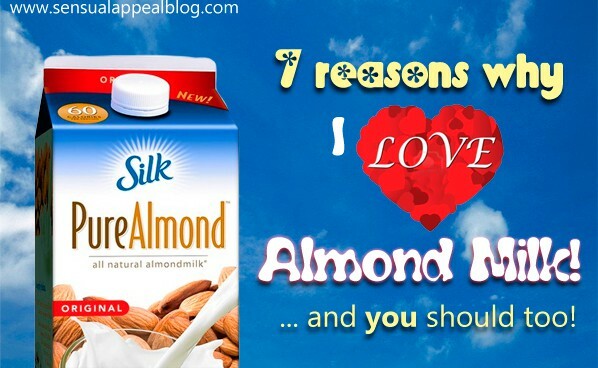 Because almond milk is amazing! And you don’t have to be vegan to enjoy this non-dairy milk and reap its awesome benefits. I started drinking non-dairy milks in high school and that was before I even knew what veganism was. A while back I posted an article after learning about carrageenan and how horrible it is for you. I also attached a list of products that occur in carrageenan, many of which are natural and organic. I had to ditch my favorite almond milk because it contained the ingredients and I wasn’t going to expose myself to that. Thankfully, I found other brands of almond milk which do not contain the yucky ingredient, one of which is the Silk Almond Milk. 1. The main reason why I stopped drinking dairy milk is because it is high in sugar and calories. Drinking skim milk isn’t the best option either although less caloric, it contains more sugars. The beautiful thing about almond milk is that you can buy it unsweetened and it still tastes great (I only buy unsweetened) and it is more than 50% lower in calories than skim milk. It’s a dieter’s dream. 2. So you might think that since almond milk is lower in calories and sugar, it must taste bad. But it’s quite the opposite. I prefer the flavor and the smoothness of almond milk. It tastes great. I use it in everything: cereal, baking, cooking, you name it. I haven’t bought any dairy milk in almost 6 years. 3. Another reason why almond milk is superior? It is lactose-free which makes it easier to digest. Most people are lactose sensitive and they may not even know it. Why risk it when you have a perfectly good alternative available? 4. A reason that many of us college students and other busy individuals may appreciate – it is often cheaper than regular milk and it lasts longer! Granted, you should drink it within 7-10 days after opening and keep it in the fridge, however before you open it tends to last a lot longer than dairy milk, which makes it that much cooler. You can then easily stock up and save money rather than going to the store so often and spending more on dairy milk that’s pricier and not nearly as good for you! 5. Almond milk offers the benefit of not having any cholesterol, saturated fat or sodium, while skim milk does have at least 5 mg of cholesterol and 130mg of sodium. 6. For the raw foodists, almond milk is the better choice as it doesn’t need to be heated or cooked, unlike cow’s milk. 7. For diabetics, almond milk provides a better choice than skim milk, as skim milk has more carbohydrates. Still not convinced? 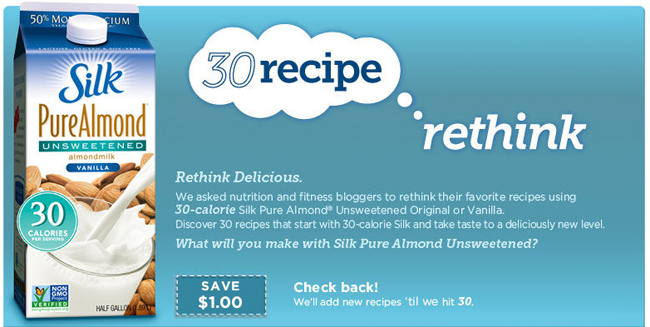 Take a look at Silk’s facebook page where many bloggers have submitted their wonderful recipes using none other than Silk Almond milk. Do it! What’s your favorite thing to use almond milk for? Disclosure: FitFluential LLC compensated me for this Campaign. I’m pretty much in love with almond milk myself! I’m going to have to check out some of these amazing meals you posted too. everything looks fabulous! while i think you make some excellent points what about protein? there the profiles btwn milk and almond milk are very different with milk having much more than almond milk. So while it is a great product and one to be considered it is “superior” in all regards. So for while for some people almond milk might be the for the better choice and for others it might be milk. it is all about the balance of food and lifestyle choices we make as individuals isn’t it? and yes i do know plenty of “healthy living” people who do not regularly use almond milk. I had never tried a non-dairy milk until a couple of weeks ago, but almond milk has definitely grown on me. I use both cow’s milk and almond milk now depending on the time of day/what I have on hand, and while I do prefer drinking cow’s milk to almond milk, I’ve found almond milk is really great in things like oatmeal and such. Almondmilk is awesome! I’m so glad I tried it out recently, now I’m hooked! I drink it daily! The only thing I used regular (non fat) milk for is my latte. I LOVE almond milk and silk is my favorite brand! It tastes so creamy without all the calories! Love it. Almond milk is the best, and I will *never* use regular dairy milk again! I also get Silk Unsweetened Vanilla, and everyone in our household adores it! My favourite non dairy milk is a soy milk available in Australia called Bonsoy. I have lived in Europe and England and travelled in the USA and I can categorically say that it is the best soy milk in the world. Sadly, soy no longer agrees with me. I tried almond milk a while ago and it was foul! The one I tried was watery and yech! However, seeing all these positive comments, I’ll try a few more brands before I categorically shun it. I love almond milk too! Although after searching around different store-bought brands I ended up settling on homemade almond milk. It’s very very simple (recipe on my blog and other recipes all over the internet too!) and you should definitely try it! I’ll probably get into trying it out when I actually live alone, I can’t really do too much homemade stuff now when I live with 3 roommates but come May I’ll be trying it out. Does it taste better than store brands? Amazing looking recipes! Silk Almond Milk is one of our favorite beverages, we use it in everything. I have try some of these gorgeous dishes! Yay thanks for stopping by 🙂 Hope you enjoy the recipes! I just bought almond milk today and was looking for good recipes and ideas for it…..this is great! !